This is my first book review for Team Fox! I'm so excited to be a part of an amazing team of bloggers - and it's great to be able to discuss the same books, as we're all receiving the same books for review! 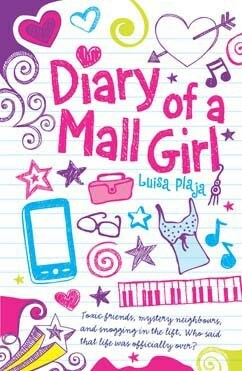 Diary of a Mall Girl was perfect summer-read: relaxing, quirky and fun! This was a laugh-out-loud book with interesting characters and a plot that kept you on the edge of your seat. Diary of a Mall Girl is told through diary entries written by the main protagonist Molly whom, at the beginning of the novel, says her life is "absolutely over." The diary entries were such a refreshing way of telling this novel, instead of a simple first-person narrative. I loved how Plaja set out the diary entries so you could have Molly slip off half-way through writing it because she needed "a moment to collect her thoughts." This was such a realistic touch to add to this novel and I fell in love with Molly's character. As for her 'so-called friends' I would definitely be willing to go out shopping with her on a Friday night. The setting - The Lillies eco-mall was a fantastic choice. I loved how it was used and being able to imagine all of the boutiques and shops. There were places that kept appearing throughout the novel that I could picture and while the girls were out shopping, I couldn't help but want to walk the mall in their shoes. Molly is someone every teenage girl to relate to - apart, in my case, from the love-triangle thrown into the plot. There were things I could recognise from her world that are completely evident in mine. For a start, I struggle with friendships and trying to fit-in: then there's the fact of exams that the teenagers in this novel are revising for. I loved the other characters in this novel. Jewel and Jasper were perfect for creating suspense as well as having interesting personalities and lives I wanted to know more about. Jewel was a secretive yet smart character, who was really intelligent and observant. I loved hearing what she would say to Molly in terms of advice but also how inexperienced she was when it comes to social-situations. I think this made her character much more realistic. The romance between Molly and Jasper was something that I was rooting for - and when it finally worked out, I couldn't help but smile. They were your typical teenage-couple but also had their own problems to work through. I couldn't help loving how they always seemed to be in a wrong-place, wrong-time situation. Molly having to think about her feelings for Jasper and find out how to interpret them was a lovely thing to see. It was something all teenage girls can relate to: struggling to work-out how they feel. And I'm glad to say Molly was no different! Ameera and Wendy I found always wanted attention. They didn't like the fact that Molly was anything more than a 'Mall girl' or someone to keep them company when the other couldn't. I was thrilled to see her finally leaving them and finding Jewel. They always believed they were superior to Molly and had the right to know and interfere with everything in her life. Thank you to Curious Fox for providing me with this book in return for a review. Great Review Sophie! Team Fox sounds brilliant and Diary of a Mall Girl sounds like a really good read. I love the cover and also how Molly was dealing with things us teenagers have to deal with. And the realistic writing style and diary format seems really cool and something I'm curious to see. It's always good when the couple your rooting for get together. Having had to deal with girls like Ameera and Wendy, I feel bad for Molly and I'm quite interested to see how she handled that situation. Lovely review as usual, I love how informative and in detail they always are. Brilliant review! Zoe and I are mentioned in the front of the book ;) FAME AT LAST. I'm sorry you found some parts cringe-worthy - I was around 11 or 12 when I read this book which is possibly why I enjoyed it a lot. I haven't read it since and I'm nearly 15 now so maybe my opinion would be more similar to yours. Fab review as always, Sophie! Thank you! I noticed and freaked-out. I was like, "I KNOW THESE PEOPLE" and "MY FRIENDS ARE FAMOUS!" - I think I tweeted a picture when I found you both? Oooh, I just reviewed this one today and rated it the same! I really liked the mall setting too! It'd be SO cool to live in a mall. You can just nip down to go get some ice cream when you feel like it, go browse some clothes whenever you're in the mood... It'd be so much fun! I also rooted for Jasper and Molly right from the get-go! YAY! I felt quite mean for giving it a 3.5 star rating but I'm glad someone else shares my views! This one sounds really cute and I look forward to reading it.